What's your software development company worth? What is an innovation services firm worth? I had to answer this question when we started broadening the ownership of my company beyond its co-founders. The traditional answer to the question of what a service firm is worth is, “not much”. All the assets walk out the door at the end of each day. Since talent is portable, a change of ownership could result in a mass exodus, destroying much of the purchased value. There are usually very few hard assets in a services firm. Who would buy such a thing, or if they did, pay very much for it? Yet the last few years have seen numerous transactions in which software development consultancies have been purchased for significant sums. This is partly explained by the general shortage of software talent, and by the value which such talent can create in a product firm. Rapidly growing product companies buying their vendors, and private equity investments in services firms, exemplify these transactions. I was not interested in an outside investor, but I still needed to establish our value. My goal was to transfer ownership in the company to our employees. I believed then, and continue to believe strongly, that ownership should be purchased, not gifted. Ultimately, my quest for the correct answer ended in the realization that there is no “truth” to be discovered here, and that my ownership is worth what I’m willing to sell it for, and what someone is willing to pay for it. The best way I could determine to find that mutually agreeable valuation was to calculate it from financial first principles. There are plenty of places that publish data suggesting that the value of a firm is some multiple of its EBITDA or revenue. Inc magazine runs such an article on a regular basis. It’s easy to conclude from these sources that valuation is a trivial exercise — just do a simple multiplication and you’re done. What I believe is commonly misunderstood is that these studies are merely reporting on transactions that happened, not what drove or justified the deals. You can calculate that a company is worth 4.5 times EBITDA only after some buyer does the investigation and due diligence, decides what they are willing to pay, then does the division to determine the multiple. The multiple didn’t determine the value, it was merely observed after the fact. The reports that provide these multiples are only useful if they represent many transactions, and if the underlying business conditions are similar and the deals were well done. Expected future profits is determined by current contracts, client base, reputation, size, operational efficiency, margin, and market demand. While the individual components of the expected future profits are very difficult to value, taken together, they can be said to have determined past profitability, and that is easy to measure. Calculating the present value of those future profits is merely recognition that a dollar today is worth more than a dollar tomorrow. In short, future profits can be predicted from past profits, and the value of that future profit stream can be discounted to map it into a value today. The model below is a simplified version of the one we use to value the company for our Employee Share Purchase Plan. I’ve removed our speculative development assets to simplify it. The numbers shown in the model are made up, not Atomic’s actual data. Before walking through it, I should point out that this model is an intentionally conservative valuation used for internal sales to current employees. Very different assumptions would probably be appropriate for the sale of the entire company to an outside entity. From recent deals I’m personally aware of I believe our valuation model is in the neighborhood of 50-100% lower than recent market sales of entire companies. The tables in the yellow block are critical parameters for determining the value of future profits. The “employee PS fraction” reflects Atomic’s convention of distributing 25% of earnings to employees through a 401k Profit Sharing plan and quarterly cash bonuses. The discount rate is a somewhat arbitrary number that’s used in the net present value calculation for the discounted cash flow analysis. It’s meant to represent a combination of the cost of money and the inherent risk of future profits. The tax rate is an approximation of the marginal income tax rate for purchasers. We use a four year average for the all-important net margin. The tables in green represent assets. Cash and accounts receivable (AR) are averages over the prior quarter. 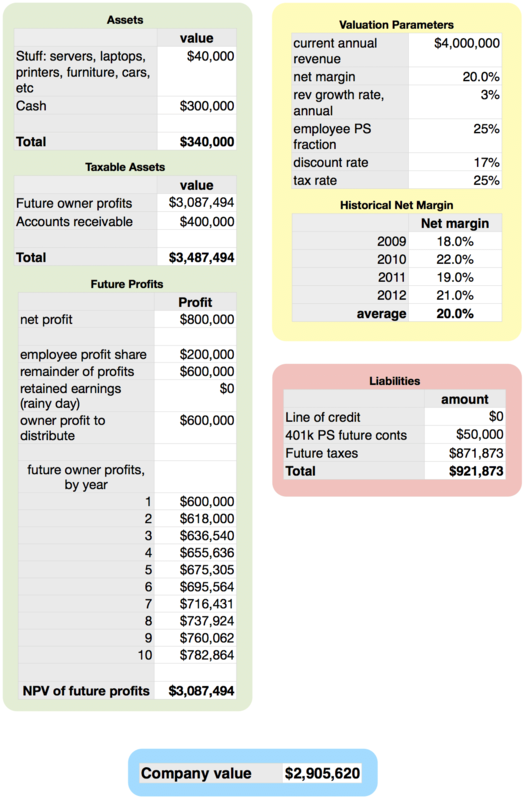 The Future Profits table shows the discounted cash flow analysis. Profits are projected out 10 years. We selected this relatively long period based on our 12 years of history and our confidence in the future demand for our services. The net present value of the series of cash flows is then calculated using the discount rate. Another reasonable approach would be a shorter projection of profits, say 5 years, with a correspondingly lower discount rate. The table in the red block shows the liabilities of the company, including the income tax to be paid on future owner profits. One way our model is conservative is that it is an after-tax value. The blue block brings together the assets and liabilities to show the total company value. We’ve used this model since the summer of 2009, and we’ve transacted approximately 47% of the company with it. We update it every quarter now for use in our ESPP. We’ve also used it to buyout departing owners. I’d be interested to hear what other firms have done, and happy to discuss our approach. The Numbers and Excel versions of the model will let you explore them more thoroughly. If you want to growth your company then your product should be informative and innovative.Your plan should be clear from the clients point of view Because client perspective is must for the company development.